Easily among the most sought after whiskies year after year, the Buffalo Trace Antique Collection is just beginning to hit store shelves. Okay, these whiskies don’t make it to the shelf. It is rare when they do, especially close to the suggested retail price of $90. 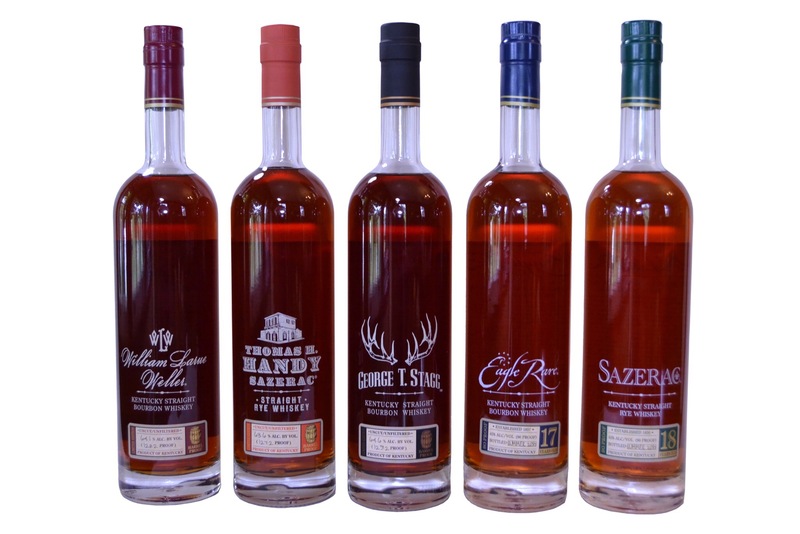 They generally represent some of the finest whiskies made at the Buffalo Trace Distillery. Let’s break down this year’s releases. The oldest whiskey in the collection, Sazerac 18-year-old rye whiskey generally represents all I love about an old rye. This year’s release was distilled in spring 1998, and, according to Buffalo Trace, was put into a stainless steel tank to prevent further aging. The barrels here are most likely from the same batch as last year’s release. The whiskey is stately and sumptuous. There is a cornucopia of baking spices on the nose, along with brown sugar, dark fruit, leather, and oak. The palate closely follows the aromas – dark brown sugar, cloves, allspice, and cinnamon. The leather and oak remind me of a small wood panel-lined room full of old books. A tannic grasp on the back palate is welcomed after what comes before it. The long finish features notes of oak spice and caramel. Barrel proof? Check. Fifteen years old? Check. A powerhouse of the Antique Collection? You bet. This year’s Stagg release comes in at a modest 129.2 proof. The whiskies of this collection are generally extremely hard to find in stores, much less at or close to the suggested retail price. Good news – 2017 is going to see a generous increase in the number of bottles of George Stagg released. Does that mean it is going to be easier to find one? I’d like to hope so, but the reality will likely prove otherwise. The nose here is full and rich. There’s lots of oak spice (though not oaky, per se), dark brown sugar, cigar box, dark fruit and burnt orange peel. Big, bold, chewy flavors of slightly burnt sugars, spice cake, sun-baked tobacco, dark chocolate and barrel char. This release of George Stagg isn’t overtly sweet, but does carry a nice complimentary earthiness to balance things. One thing to note is the oak. While an important element of Stagg’s flavor profile, this whiskey is not over-oaked whiskey this year. Balance is key this year. The finish is long and bittersweet, leaving hints of dark chocolate, oak spice, and dark toffee. I generally consider Eagle Rare 17 the sleeper of the collection. It is the oldest of the three bourbons at 17-years-old. Often overlooked by whiskey fans for some of the barrel strength offerings, Eagle Rare 17 is bottled at a modest 90 proof. This year’s release is more limited than usual. Thirty six barrels were selected, but there was a high evaporation loss of 89.5%. That means only a little more than 10% of the original whiskey remained in barrels. The angels were especially greedy. The whiskey itself offers complex aromas of oak, dark caramel, freshly rolled cigar, vanilla and spice. There is burnt sugar and oak spice on entry, followed by leather and firm but not dominating oak tannins. A bit of vanilla and cloves help temper the oaky note. The finish is dry with sweet oak and tobacco. The popular barrel strength 12-year-old bourbon is a “tame” 128.2 proof this year. Distilled from Buffalo Trace’s wheated mash bill, William Larue Weller is usually the most balanced whiskey in the collection. It’s also sweeter than the rest. The rich nose shows hints of toffee, vanilla creme brûlée, cinnamon stick, dried apricots and a touch of lavender. On the palate, brown sugar and nougat kick things off. Waves of vanilla are contrasted by oak spice and leather. The long, warm finish is a bit oakier than expected. This 6-year-old rye whiskey’s inclusion in the Antique Collection still baffles me. The next youngest whiskey is double the age of this one. There’s nothing “antique” about Thomas H. Handy Rye. Okay, venting over. Uncut and unfiltered, the 2017 edition of Handy is bottled at 127.2 proof. What you’re looking at is basically is select barrels of Sazerac Rye at cask strength. Nothing wrong with that, in and of itself. The nose is hot at first. A little airtime reveals rye spice, vanilla, toffee and dill. Taste-wise, the vibrant whiskey features hints of buttered rye toast, cinnamon, cloves, and maple syrup. There is a slightly sharp note here I find in a lot of young rye whiskies. The finish definitely warms the chest, leaving behind sweet and spicy notes. Thanks to Buffalo Trace for the samples. As always, all thoughts and opinions are my own.